ORI MENASHE is co-owner and executive chef of Bestia. GENEVIEVE GERGIS is the co-owner and pastry chef of Bestia. LESLEY SUTER is the former deputy editor for Los Angeles magazine and a two-time James Beard award-winner for food writing. "The recipes are uncompromising, calling for smoking, then dehydrating and finally grinding anchovies, and smoking pork fat to infuse bourbon to make an Old Fashioned. Those who push forward, however, are rewarded with dishes that smartly layer flavor like stinging nettle pappardelle with mushrooms and a fried egg, and a butterscotch-coconut tart." 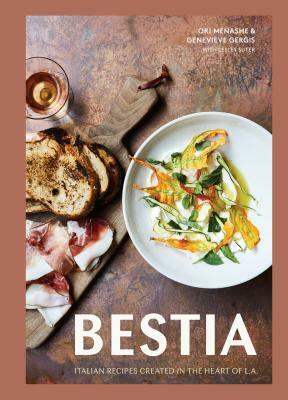 "L.A.'s insanely beloved restaurant, Bestia, has put together a cookbook full of the same flavorful regional Italian cooking served at the beautiful restaurant. There are chapters on making bread, pasta, and charcuterie, as well as sections about building flavor with stocks and sauces. The accessible instructions just might make it possible to recreate the flavors you loved so much on your last trip to Los Angeles." "Now, after nearly a decade in business, what is arguably the city’s best Italian restaurant can enter our kitchens. ... The Bestia staples are all there, including the cavatelli alla Norcina, the agnolotti alla Vaccinara with oxtail, the ’nduja, and the branzino with herb confetti, as are a few cocktails, for good measure. Much like the agnolotti, this cookbook is a must-have." "A soaring indoor-outdoor fantasy of a modern Italian restaurant." "Bestia exemplifies the modern Italian restaurant in Los Angeles, but at this point, Bestia may be best known as the downtown restaurant you can't get into."